If you have doubts ?. we will provide you with proofs of the production originality. We have sold more than 20,000 T-shirts all over the world. Due to a lot of experience in this sphere, we can help you find what you have been searching for reasonable price. Size XL boys (18-20). Length 70 cm. A great item for the active Nuggets. Size: Adult 3XL, 28" from Arm pit to Arm pit / 33" from Top of neck to bottom hem. supporter, basketball enthusiast, or fan of the sport as a practice/training/scrimmage/. Overall length (taken from the back at top of collar to the bottom hem): 29.5". Chest (armpit to armpit):23". Size: XL (18-20). Shell 100% Nylon; Knit Trim: 100% Polyester. Reebok Hardwood Classics Vintage Denver Nuggets Jersey, men’s size 2XL. Jersey is modeled on the ‘87-88 Alex English #2. Retro NBA style. Measures 26.5 inches across the chest and 34 inches in length. Good condition - no discoloration, holes or fraying. See images for detail. I listed this item to the best of my ability. If you have any questions, let me know at least 24 hours prior to the listing’s end. PayPal is the preferred payment method. The item will be shipped within two business days after the payment is received. Please leave positive feedback if you had a good experience, I will do the same. If for some reason there is an issue with the item when it arrives, please contact me so I can address it. Free shipping in the USA! International shipping is via the Global Shipping Program. ***if you want item shipped to a different address, please message me before purchasing. **** Item must be returned in identical condition for a refund. Item has been previously worn. See pictures for detail. Please see photos for measurements. Used/previously worn clothing articles may not fit as tag suggests. Double check measurements before purchasing. REEBOK NUGGETS. CARMELO ANTHONY nba THROWBACK Jersey YOUTH BOYS (5-6) NWT! Brand new with tags. Measures 14 inches pit to pit and 19 inches in length. Features screen pressed letters,numbers. Made By : Reebok. Size : Youth small. This 3xl Jersey shows little wear any where on it . It is a Carmelo Anthony #15 Denver . If you have any questions or need more pictures feel free to. Thanks for looking and good luck. Don’t forget to check out my other items available for purchase! 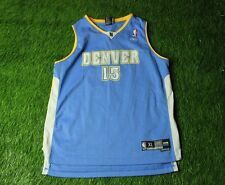 Vintage Carmelo Anthony #15 Denver Nuggets Jersey by Reebok, Youth L, NICE!!! Size: Youth Large (14-16). This jersey is in FANTASTIC condition, and you will be MORE than happy with the GREAT condition of this jersey. Height (top of shoulder to bottom) - 25". 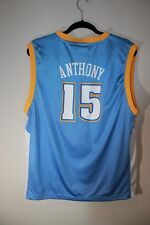 This is a previously-owned, youth-large (YL / size 14-16), white and light-blue jersey with “Nuggets 15” printed on the front and “Anthony 15” printed on the back. The Denver Rockets, a charter franchise in the ABA, was one of four ABA teams taken into the NBA, along with the New York Nets, San Antonio Spurs and Indiana Pacers. Condition: Good overall condition. The numbers and letters are worn. All clothing should be washed first after receiving it. I do not wash clothing due to possible allergic reactions from the different types of detergents. You pick which one! Never been worn. 100% nylon, screen printed. Reebok Denver Nuggets Carmelo Anthony NBA Basketball Throwback Jersey X-Large I do combined shipping on my footwear. Ask about other items. Please ask any questions you might have before bidding item sold as is no return. Please contact me before opening a case. I will try to work things out. I only ship outside the US if you're signed up for the international shipping program. Sz is Youth S (8). 100% polyester. Embroidered logo. Item is in very good used condition! Has NBA and Reebok logo embroidered on left shoulder. Has letter "N" embroidered under the v-neck and "Denver" with #15 embroidered on front. Has Anthony and #15 embroidered on the back. Size : 2XL. Denver Nuggets Cap White NBA Reebok Basketball Sport Fan Hat. NBA Denver Nuggets Sports Fan. Good condition overall. Light wear from use. There is some staining on the Jersey. Please see photos. Since it is White, it should be easy to get out but I have not attempted. Size XL Long. Length - 88 cm. Length on back - 94. Their is a small marker stain on the back tail of the jersey (see last photo) but is hardly noticable while wearing. All logos and patches are sewn on. The overall condition is good. Kelly and Mike. The jersey was made by Reebok is in good pre-owned condition. The jersey is a size. Back (Neck Line to Bottom)- 29 in. Chest (Pit to Pit)- 23 in. Shoulder to Shoulder (From seam to seam)- 17 in. Neck (All around from top button)- 18 in. I will gladly work with you to resolve any problems. Sewn jersey. Jersey is in used condition.